On Friday 20th May 2016 six members of CLIS met in Oxford, a city we are now familiar with, to visit the headquarters of UCCF, the Universities’ and Colleges’ Christian Fellowship. We first had our usual excellent lunch in the Mitre Hotel (we ought to qualify for a discount as one of their regular patrons! ), joined by two of our hosts from UCCF, Kat Luke and Brian Weaver. We then proceeded to Blue Boar House, the headquarters of UCCF and also of IFES, the International Fellowship of Evangelical Students. The building is partly recent and partly historic, that part being formerly the ‘Sherriff’s House’ belonging to Oxford City Council, although very little of the original could be seen on the inside. The accommodation certainly provided a bright and modern environment for the offices and meeting rooms of the organisations. UCCF and IFES in fact only moved to Oxford in 2012, having formerly been lodged for many years in Leicester, and before that in Bedford Square, London. Many members of CLIS will be acquainted with UCCF from membership of Christian Unions in their student days, although for most of us it was then called IVF, the Inter-Varsity Fellowship! After its beginnings in 1919, IVF was formally constituted in 1928, the main founding members being the Oxford and Cambridge Inter-Collegiate Christian Unions, although the earliest known Christian Union was Aberdeen in 1755! A tour of the building revealed that many of the rooms are named after well-known figures in the history of UCCF. Appropriately the kitchen and eating area is known as Grubb’s – after Norman Grubb of course! The library is called Uncle John’s, and a nearby office is The Doctor’s Office; those who know their evangelical writers will recognise the familiar names of John Stott and Martyn Lloyd-Jones. Perhaps not surprisingly the group spent a considerable amount of time in the library; this is a joint library owned by UCCF and IFES, and by Brian’s own admission, as well as the groups’ casting a quick professional eye, is in need of some care and organisation. The library is quite well stocked, particularly of course with IVP publications (IVP being formerly the publishing arm of UCCF, now independent and in partnership with SPCK), but had no organised cataloguing or borrowing system – not a computer in sight! The group was able to make several impromptu suggestions, and we offered more formal help if required. We also looked at the archives, which comprised just about everything from individual CU minute books to photographs of conferences and events, also in need of some organisation and cataloguing. Over a welcome cup of tea, we then heard about some of UCCF’s recent initiatives. One of the most successful is ‘Uncover’, a version of John’s Gospel in the NIV with comments and questions for thought and discussion; many students use this individually with enquiring friends, as well as its being a basis for seeker Bible studies. It has been translated into twenty languages, and we saw a copy of the Chinese version which has proved extremely valuable in opening up the Christian message for students from China. Another useful series is the ‘bethinking’ series of booklets on difficult questions, and we were given copies of veteran author Michael Green’s Jesus for Sceptics in that series. ‘Forum’, the regular training event for CU leaders at the Quinta Centre in Shropshire, now has an attendance of over a thousand, and caters for those in a wide variety of leadership and planning roles in Christian Unions. UCCF is now planning to develop training resources for fourteen to eighteen year olds, so that they are prepared for life as a Christian when they come to further education. We had some discussion on opportunities and challenges facing Christian students today, often a different world from the one we remember as students! Many of us use the UCCF prayer calendar to ensure we pray regularly for witness in universities and colleges, and we were able to give feedback and useful suggestions to Grace Kinneard who oversees that publication. We were encouraged to hear that things have moved on from the situation a few years ago when several CUs were disaffiliated by their parent Student Unions because of their perceived ‘exclusiveness’. Now Christian Unions often win awards for being the best society for welcoming newcomers. There seems to be more tolerance in listening to different viewpoints, and this can work in favour of students being open to enquire about and investigate the claims of Christianity. CUs can provide a ‘safe space’ for students of other faiths and none, in particular those from Muslim countries, to find out exactly what the Christian gospel is about. 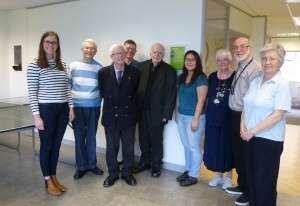 The afternoon proved extremely informative, and we are very grateful to our hosts, Kat, Grace and Brian for their welcome, and giving us a better insight into how we can support Christian students today in their fellowship and witness. Derek Jowett, BA, is a retired librarian living in Stroud, Gloucestershire.